Thank you Circulon for sponsoring this post! 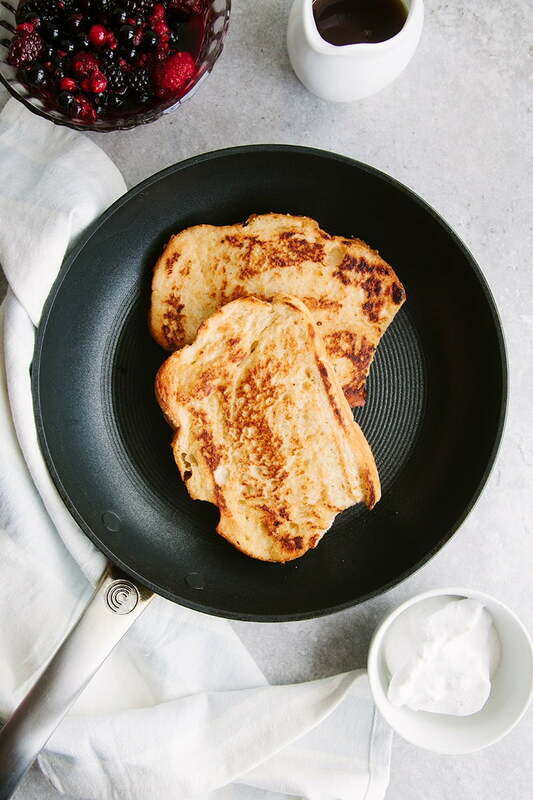 A few weeks back, I asked my readers on Twitter what recipe they’d like to see next on the blog and there was a big percentage asking for vegan French toast – so here it is! They sent me the Circulon 24cm Skillet from their new Ultimum high density & forged cookware range. It’s ultra non-stick (PFOA free!) and dishwasher-safe which makes things so quick & easy and is totally in keeping with the theme of this recipe. It just suits my laziness in general. 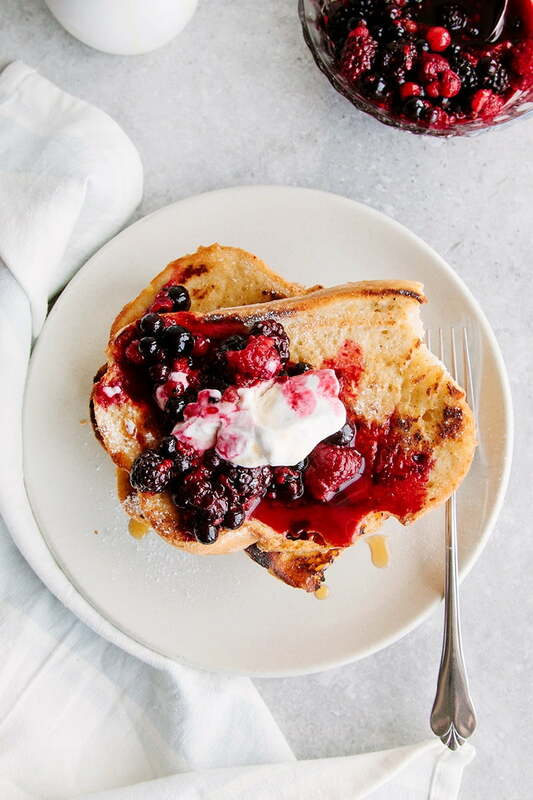 But back to this French toast… I just love how something that is so simple to make and ready in a flash can taste this indulgent! Perfect for Sunday mornings when you want something special for breakfast but nothing too complicated to make. The base recipe is delicious with all sorts of toppings. I chose to just add some cooked mixed berries, some maple syrup and a dollop of coconut yoghurt which definitely hit the spot. A quick and easy breakfast that tastes like a special treat! Previous Post: « Vegan “Twix” Tart! Will be making these for a party and breakfast a few times. Since my daughter went vegan several years ago, I have been led toward a plant based dr iet and the eggs are the worst thy o give up. I'm n ok t ready to give up p all my Carnivorous tendencies but eat vegan probably eat 3 to 4 times a week. This looks great! My daughter has a chickpea allergy, though, is there any other flour that might work? I know chickpea flour has a very specific profile, so this question may be a looking shot. Thanks anyway! We will enjoy this Sunday morning. Hope you enjoyed it, Erin! Can anyone tell me if it's normal for my french toast to have a sticky teaxture on the ouside instead of golden brown? I leave it on the pan for much more then a minute but it doesn't seem to get cooked well enough. I usually crave something sweet for breakfast and this is my new favorite things to make whenever I have some extra time on my hands. It's tastes just like real French toast but it's completely vegan so I'm extremely happy I found this recipe :) thank you for sharing! That makes me so happy to hear, thank you Erica! It's one of my favourite breakfasts for the weekend, you've just inspired me to make it again this Saturday! Hey honey! looks delicious, but where can I find recipe for blueberries jam? This looks so delicious! Is the recipe easy to double or quadruple? Would love to make it for a group brunch. My boyfriend eats a lot (I will forever envy his metabolism) so I had to double this for us and it turned out great!! What could I sub the chickpea flour with? The chickpea flour is an essential ingredient as it's what provides the eggy texture and flavour. I've heard people make french toast with corn starch before but that would be a whole other recipe. It's very easy to find though! It's often called gram or besan flour and you should be able to find it in the world food aisle of your supermarket or local Asian food shop. I use to in the 70s use flaxseed for the egg mixture! it doesn't describe what mixture to dip the bread in? Is it just the milk? 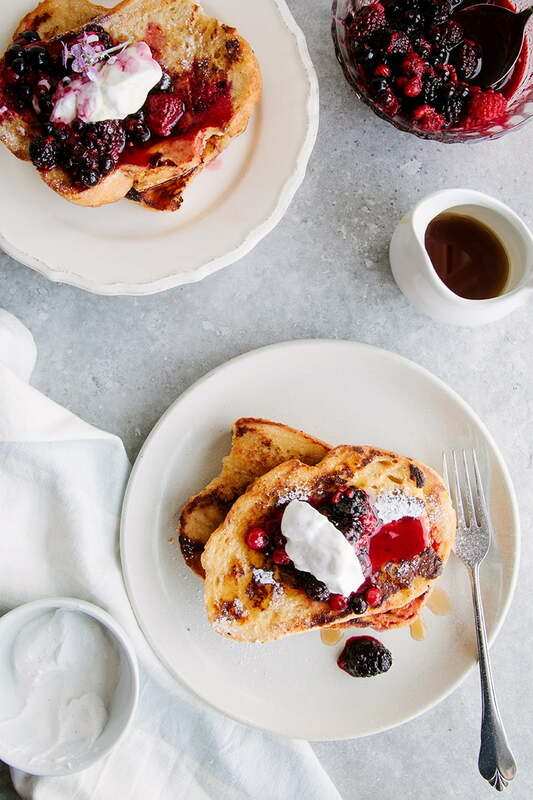 I LOVE french toast and it's probably one of my hubby's favorite breakfasts that I make! It's so comforting and delicious. This is a beautiful version and honestly, who needs eggs?! These are perfection and the berries on top are so pretty! BEST. FRENCH. TOAST. EVER. yummmmmmy! That looks so delicious and your photos are beautiful! I do not make nearly enough French Toast. And it's so easy, so I'm not sure why. I just never think about it. This dish is gorgeous! Love that berry sauce! Saaaaaaaaaame. That needs to change! French toast is one of my favorite breakfast foods. I love that gorgeous fruit compote topping too. YUM! This looks so yummy, Aimee, and your images are gorgeous (of course!). 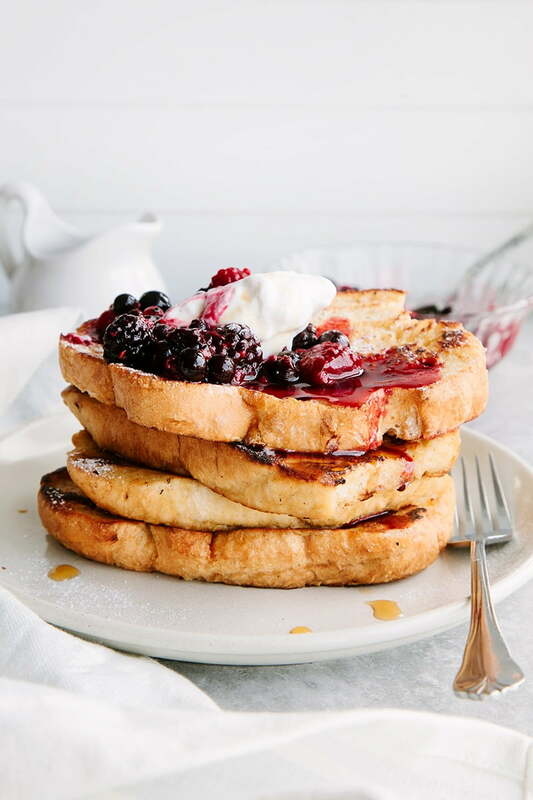 I've never had French toast before (vegan or otherwise) - does the bread go soggy at all, or is it crispy, as with toast done under the grill? Thanks! Girl, you are missing out BIG time. It;s crunchy on the outside but like a delicious, sweet, eggy, fluffy texture inside. Just heaven. Looks lovely. Using vegan custard powder mixed with non-dairy milk also gives a lovely eggy bread coating and texture! Ooh good tip - I know that using starch can work too, which is why custard powder would work. I might actually try mixing custard powder with the chickpea flour sometime! Such a pretty looking breakfast! I absolutely loved when I learned how to make french toast without eggs.....what a game changer! Right? So easy for such a delicious breakfast! Such a pretty french toast! I love french toast, so much easier to me than pancakes. It's a staple around here for our fancy breakfast mornings. Those berries and whipped topping are making me drool! You're right, so much easier than pancakes! This looks so good! I love French toast. Styling is perfect. Recipe is perfect. Gooey berry goodness on top making my mouth water is perfect. I am craving this so much right now! Haha thank you so much, Natalie! You're the loveliest. This looks SO GOOD! 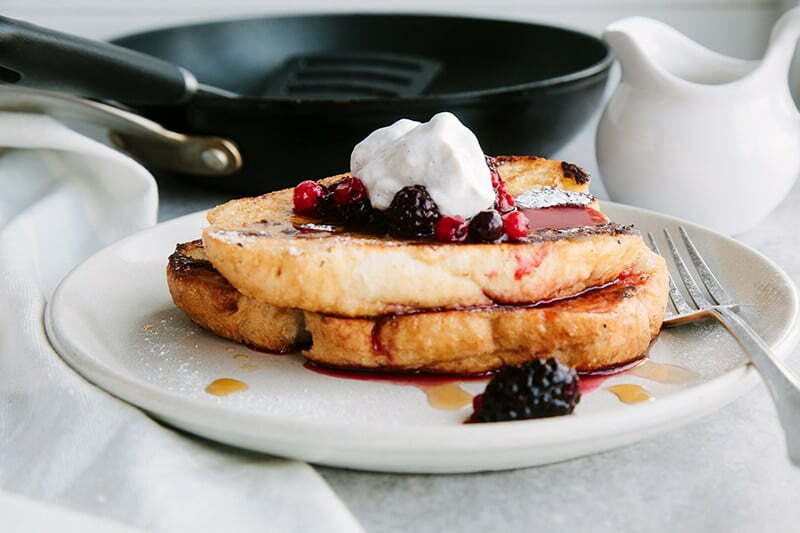 I've never used chickpea flour for French toast, but I need to try it! 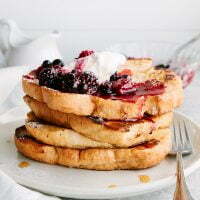 Chickpea flour is so good for French toast! It really works so fantastically! I think I'll be making some french toast next weekend, I haven't made any in months! Chickpea flour works so well to get that eggy bread texture and taste - I love it!